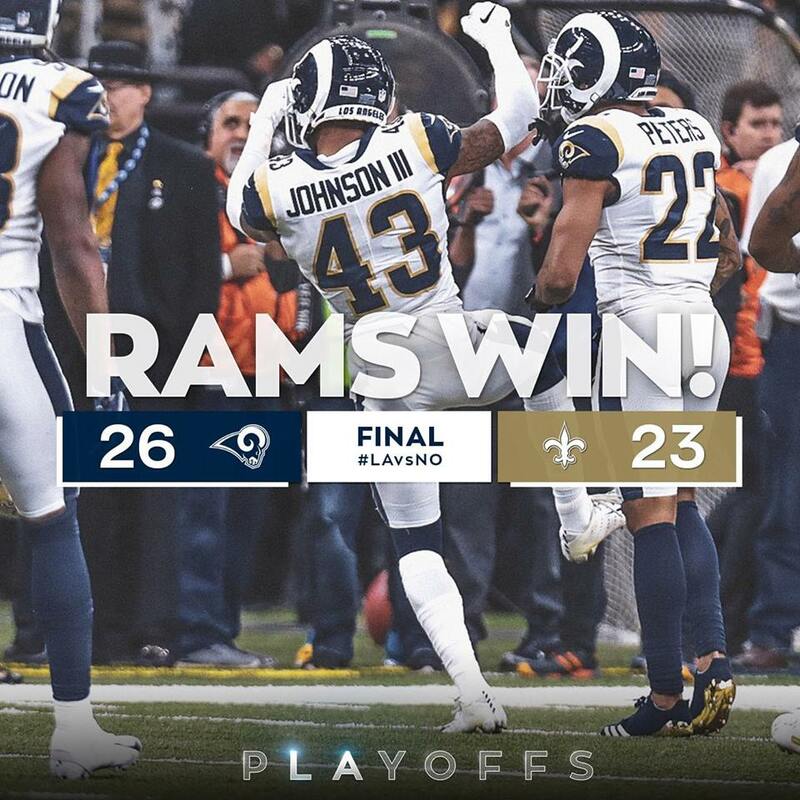 The Los Angeles Rams managed to defeat the New Orleans Saints in an overtime nail-bitter and are heading to Super Bowl LIII. UNITED STATES—It was the football game I was more intrigued to watch all season: the NFC Championship Game. On one side we have the Los Angeles Rams who came into the season dominating all season long. On the other end, there was the New Orleans Saints who have proven to be a force to reckon with winning the NFC South with an impressive record of 13-3. The Rams held an impressive record as well of 12-4. When these two teams first met, I was certain the Rams would be victorious, but the Saints proved otherwise. So seeing these two teams meet again, with one being victorious and heading to the Super Bowl, the other having to live with the realization they came so close, but it was a no go. The Saints placed a beating on the Rams during the first quarter with a score of 13-0. That was the result of two field goals and a touchdown catch courtesy of Garrett Griffin. However, the Rams would gain some momentum during the second quarter. First up, Greg Zuerlein completed a 36-yard field goal completion, followed by a 6-yard touchdown by Todd Gurley II. At halftime, the Saints led the Rams 13-10. The defense for both teams proved to be impressive. The Saints kept the Rams scoreless in the first quarter, while the Rams kept the Saints scoreless in the second quarter. Things got more fun in the third quarter as both teams managed to score touchdowns. The score remained 20-17, with the Saints leading by 3. However, in the fourth quarter, Rams quarterback Jared Goff made some moves placing his team within mere yards from scoring a touchdown. For the Rams to get this close and still not be able to score a touchdown made it clear the Saints defense was not messing around. With a fourth down looming, the Rams had to go for a field goal, when they should have had a touchdown. However, the game was tied 20-20 with just under 5 minutes left in the game. Man, that pass by Saints quarterback Drew Brees to Joyner was awesome. I mean with less than 2 minutes in the game. It was quite close to say the least. If the Saints would have scored, the Rams would have to move steam to have a fighting chance. The Saints weren’t happy with a call that should have been a penalty, but the referees didn’t see it that way. Trust me this is something that will be talked about for days and days to come. They were forced to rely on a field goal giving them a 23-20 lead with less just over 1 minute and 40 seconds left in the game. If the Rams score, this game might be sealed and over with, and Goff gave every attempt in his power to make something happen. With the clock ticking down, Robert Woods caught a ball from Goff that could have been a Rams touchdown if he was able to keep his footing on the ground. This game is a freaking nail-bitter; I feel like every game I’ve watched involving the Saints has kept me on the edge of my seat, and I love every minute of it. With 19 seconds left a field goal would determine if the Rams would send this NFC Championship game into overtime. It was all on Zuerlein to successfully complete a 48-yard field goal attempt, and we’re going into overtime people. We’re heading into overtime with New Orleans winning the coin toss, but the Saints momentum was loss with the Rams catching a break with an interception. That interception would be a costly mistake for the Saints, especially Drew Brees. It comes down to a 57-yard field goal attempt by Zuerlein to send his team to the Super Bowl. This wasn’t a nail bitter, this was that suspenseful moment in a horror movie that you have no idea how it will end. It was a victory for the Rams who are now heading to Super Bowl 53, and the Saints are done. Whoa, just imagine if Brees didn’t throw the interception pass, this might be a totally different game. However, the first contender in the Super Bowl has been revealed, it’s now a question of who the Rams will battle. Previous articleWho Will Get Oscar Love?